For Round Robin Reviews click here. I do LOVE to read. Whenever I am not chasing mice, eating, or napping, you can almost always find me on top of a good book! I haven't read a lot of books about cats though, so I'm really looking forward to finding some good ones through this guild. 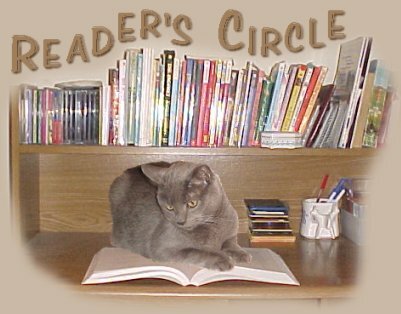 I did read one long ago - not just about cats - but there were cats in it - that was "All Creatures Great and Small" by James Herriot. He actually had a series of books - and then they turned into a television series too. They were all wOnderful - and actually might be worth reading again! Here is a list of recent books I have read by some of my favorite authors. & all his prior books. I must admit I am thoroughly enamored with Archy McNally -- Lawrence Sanders cad of a hero in all the McNally's series! These mysteries are written entirely "tongue-in-cheek" and are a sheer delight! 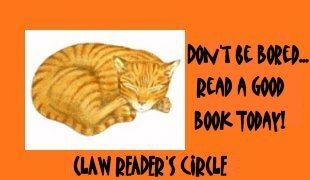 The other series I must read as soon as they hit the shelf is the Stephanie Plum series by Janet Evanovich -- One through Eight - they've all gotten a 5 Paw rating in my opinion! I just found out NINE is out! MEOW! Gotta get it! The Life Of Pi, by Yann Martel ~~ This was a really unusual book for me to choose, but I enjoyed it furry much! It is the tale of a very spiritual, and very spirited young boy who's family sells their zoo in India and heads for a better life in Canada. Unfortunately, the ship sinks and the boy finds himself aboard a life boat with a zebra, a hyena, an orangutan and a 450 lb. bengal tiger. Supplies are limited, the tiger takes care of all the other wild life, and it comes down to only Pi and the tiger are left. I'm not going to tell you how the boy survives, but the read is worthwhile. There were a few things that bothered me when I had finished this book, and I would love to talk to other people who have read it, about them. Sooooo, if you DO decide to read this book, please let me know when you are done! ISHMAEL by Daniel Quinn. ~~ Have you ever found yourself feeling like something is missing? Like maybe you haven't been given all the pieces to the puzzle? Like life is working, but maybe you're not IN on the whole story? Well, this is the subject of Ishmael. The story begins when the story teller reads an ad in the personals section of the newspaper. The ad reads "TEACHER seeks pupil. Must have an earnest desire to save the world. Apply in person." Well... that was enough to catch this kitties attention! And the story being told was good enough to keep me with it from the very first page. From the moment the pupil meets the teacher, the reader learns right along with him. Ishmael makes you think! There are no kitties in this story, but there certainly is one very very smart and likable gorilla! I think anyone would enjoy this book! It was recommended to me by an entire 12th grade at my meowmie's school! I gave Ishmael 5 paws and a non-opposable thumbs up! CAT LAUGHING LAST by Shirley Rousseau Murphy. ~~ This was my first ever Joe Grey mystery, and it was a wonderful story! I do definately like Joe Grey and his purrtner Dulcie, and their little furriend Kit. In this story Joe and furriends are on the prowl for a murderer and a thief or two! They use their extemely high feline intelligence and their adorable purrsonalities to worm their way in to places humans could never. In this way they are able to help the Molena Point Police solve this delightful mystery! What I really liked was that even though Joe tells the story beautifully, he only lets us in on a little bit at a time, and he never gives the end away ... until the end! He's a wonderfur kitty ... my new hero! A CAT IN A KIWI CON by Carole Nelson Douglas. ~~ I found this book to be a "puzzler". It had too many sub-plots with no real plot at all, and while there were a few murders and other attempts to be criminal, nothing ever really tied together. At the end of the book I still found myself asking "who done it?" -- and in some cases, "what did he do?". I was certainly asking what was "that bit" in the story about? Why put it there if it doesn't contribute to the adding up process? Amazingly, I did enjoy reading this book... it just needs about 10 more chapters to actually finish it up! I would only give this book 2 paws. DAYBREAK by Belva Plain. ~~ I have "tried" to read this author in the past and have never really been impressed with what I've read. But when I opened DAYBREAK, I was hooked from page one! This is the story of two families; The Crawfields and The Rice's, brought together by tragedy. In the first few pages you find that the families had their babies switched at birth, nearly 19 years ago. The Crawfields are in the process of losing their precious child to a disease passed on from the Rice family. This is the main plot of the story. The Rice's also have a child suffering from the same disease and know what the Crawfields are going through. However, the story goes on to involve you in the "real lives" of these two families as one wishes to get to know their "lost" child, while the college aged child resents even finding out that there's been this mixup. Sub-plots involve religious differences as one family is jewish while the other are gentiles, political differences, and very strong moral issues. This book is not light reading, but it is a very GOOD story and it really makes you think about life. This book had a pretty big impact on me, and I would LOVE to mew with other kitties who have read it! I hope you will. Would you like to check out my other CLAW pages?